Rate this Article Several factors have to be taken into account with the use of VR in the classroom. Both advantages and dis-advantages have to be weighed, but the continual advancement of the technology looks promising for application to education. Let’s take a look at the possibilities. One of the things that concern an educator, especially in the primary and secondary levels would be the effectiveness of ones teaching or method of instruction. The teacher-student relationship is much more personal as compared to university where the responsibility for learning and being able to understand the lessons is drastically shifted to the student. As much of the expectation is placed more on the educator in both Elementary and High School, teachers need methods of instruction that would greatly help out in the facilitation of knowledge to make the students ready for university life or life in general. Both Audio and Visual aids have played a large part in the classroom greatly simplifying the teachers explanation. The advent of computing devices has provided educational tools through the use of digital technology to enhance the education process with the use of technology. Most of this however, provides a third person point of view. Some are interactive while most are passive forms of instructions. Discussing the battle of Gettysburg in the classroom while viewing videos of re-enactments will provide information to the student. Experiencing the Battle first hand (albeit a simulation) can provide a form of instruction and knowledge transfer like never before. This is the potential of Virtual Reality. Let’s first take a look at the possible advantages and dis-advantages that can occur by using Virtual Reality in the classroom. Advantage wise, VR can provide outstanding visuals that just isn’t possible in the current classroom setting. Viewing an environment in 3D while being in the midst of it provides a visual and audio impact that the usual audio-visual classroom aids cannot provide. VR creates interest. Most people and students in general, would rather watch something than read about it. After all, it is much easier and quicker to understand something by watching it. As VR is a visual experience with maximum proportions, students will most definitely find it interesting. VR does not feel like work. When people enjoy doing something, the tendency is for it not to feel like work. To begin with, VR is foremost associated with gaming and when learning is presented in an immersive game-like environment, things start to get fun and enjoyable. VR also encourages student attention and participation. As the VR experiences are quite fun and engaging, students will tend to be focused with the topic at hand and would want to participate by talking about their own VR experiences. VR opens new possibilities in learning as more and more instructional applications are being written and developed. VR reaches out to a diverse field of learning from science, medicine to literature and even languages. VR can help eliminate barriers to understanding by presenting information in an immersive visual way. As for its dis-advantaged, VR can contribute to anti-social behavior and isolation if not used properly. Since VR encloses the student in an alternate world, a lack of communication with others and participation as a group may cause serious isolation issues. However, proper VR management by the Teacher eradicates this issue. VR is addictive. This may pose a serious problem in the long run if not dealt with correctly. This includes everyone who uses VR more than once or is already doing it on a regular basis. Just like video games, VR is addictive and the last thing the school wants is to have their students become VR junkies. VR can also have functionality issues that can be a problem during classtime. Students as they get younger tend to be playful or downright mischievous. VR equipment is prone to bumps and bruises with a big sign that should be printed on it, Handle With Care. It’s doubtful a child seeing all those unbelievable things would care until the proverbial Oh oh… Besides, a series of unforeseeable events can never be foreseen and the whole VR setup goes Out Of Order. Which now brings us to the biggest disadvantage probably, the Cost. Yep, VR is expensive. When we talk about Oculus or the Vive, a one-on-one ratio for every student would mean a tuition fee for a one-on-one ratio. Oh boy, you can probably get a Ferrari for it. Well maybe. Google however is trying to remedy the situation but no matter how affordable the Google Expedition set is trying to be, a lot of schools won’t still be able to cut it. An all classrooms equipped scenario may still be a long way but if schools and educators with the help of government continue to work for it… they did put Apollo 11 on the moon. With that said and done, let’s now take a look at how VR can be and is being applied to today’s classrooms. First off, educators interested in VR will be glad to know that several pilot projects to implement VR in the classroom are currently ongoing in several chosen locations around the world like the US, Canada, Australia and India among others. These are implemented by organizations and concerns that are pushing for the use of VR in the classroom setting like the Google Expedition Project and Foundry10. In the implementation of VR in the classroom setting, these pilot projects are currently addressing 4 main concerns. First would be the application of VR in the classroom. These would include the simplification of the learning process where VR greatly reduces the cognitive load for the students to grasp the topic at hand. VR reduces the effort to sit down and read and understand the words as it is already presented to them visually and immersively. Also, the use of VR is opening up additional experiences like perspective and empathy as the student finds him or herself in the midst of the information being presented. As the implementation is in the initial testing stage, project objectives include the observance of the use of VR in classrooms, collate teacher and student feedback and connect educational need with the VR app development industry. There are currently 2 models for VR in the classroom. These are Individual Experience models and Group Experience models. In the Hot Seat model, one student dons the VR headset while others observe the experience on a large screen. The entire class then has a shared social group discussion on what happened during the VR session. The VR experience did not isolate the hot seat user rather opened an avenue for group activity. VR interactive activities that encourage teamwork and group participation are categorized into this. Individual experience is when each student is provided a VR device to experience it for oneself. Examples of this would be the use of smart phones and google cardboards provided to a class like what the Google Expeditions project is doing. Second would be content and accessibility. One of the main points of concern would be the availability of educational content for classroom use. There is still not enough VR content to address the educational curriculum of schools whether canned or custom made. Kids want to experience things not possible otherwise like being on the surface of mars or inside the crater of a Volcano. Kids also want to see things through somebody else’s eyes like an important person or event in history, like being in the middle of the battle of Waterloo with Napoleon Bonaparte right in front of them. Students in middle school prefer challenges that would help them understand things better. A teacher used a bomb disposal VR simulation to encourage students to talk and think at the same time thus using regular VR content in an educational way. The third would be if students are ready for VR. Current students who are familiar or have been exposed to VR are more likely to have a positive outlook in the use of the technology when it comes to learning. Many students who find it difficult to learn via printed information believe that VR provides a way for them to be able to grasp the lessons with less difficulty and really understand it. However, not all VR simulations will fit every student as some may have medical conditions or phobias which have to be taken into account and addressed first. However, from a general point of view, most students are excited and ready. The fourth would be content development for educational use. Educators should communicate the educational needs where VR can be applied to, to software developers so they can create more interactive content for both individual and group classroom models to make VR learning a viable and fruitful experience. For custom content, schools who are initiating VR programs in educating their students are starting to create the applications in-house by hiring developers or letting their advanced students develop it. There are several current VR products that have been developed for education. This range from specific self contained HMD's that can run it's own specific apps and content like the integrated Class VR Headset to the more traditional Oculus Rift and HTC Vive. As for the most available and probably most cost effective option, nothing still beats the Goggle cardboard. 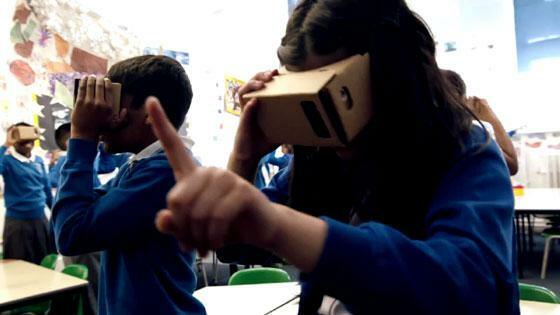 With the recent release of Google's Expedition project that provides an entire individual class set, the world of VR learning just got practically accessible. There is no need for a really fast internet connection as the teacher’s tablet already acts as a server for the VR class set providing the content that is of course under the control of the Teacher. VR is a very immersive educational tool and no doubt very useful but still quite new in the classroom setting. A gradual natural progressive approach into the classroom would probably be the best option so that students can first get to play with it and once they get used to and excited about it, start learning from it. Whatever the issues which have to be ironed out with the use of VR in education, let us be reminded that the technology is improving and is very much a part of our human evolution and we are bound to end up using it sooner or later.